This article is about the fire Pokémon featured in the Super Smash Bros. series, who is known as Lizardon in Japan. For the boss from Wario's Woods, see Lizardon. Charizard is a Fire/Flying-type Pokémon resembling a winged European dragon. In the Pokémon series, it evolves from Charmeleon, which evolves from Charmander, and is one of the three fully-evolved starter Pokémon of the Kanto region. 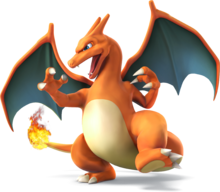 As of Generation VI, Charizard is also capable of Mega Evolving into Mega Charizard X or Mega Charizard Y, the former of which appears as its Final Smash in Super Smash Bros. for Nintendo 3DS and Super Smash Bros. for Wii U. Charizard appears in Super Smash Bros. and Super Smash Bros. Melee as a Poké Ball Pokémon, and in Super Smash Bros. Brawl, Super Smash Bros. for Nintendo 3DS / Wii U, and Super Smash Bros. Ultimate as a playable character. When playable, its fighting style is similar to Bowser's, as a slow, powerful, heavy reptile with some fast movement options and the ability to breathe fire. Charizard in Super Smash Bros.
Charizard appears in Super Smash Bros. as a Poké Ball Pokémon. When summoned, it turns from side to side, using Flamethrower to attack opponents. In Super Smash Bros. Melee Charizard once again appears as a Poké Ball Pokémon, retaining its attack and pattern from the original game, but this time using a 3D model ported from the Nintendo 64 Pokémon Stadium games instead of a 2D sprite, like all other Poké Ball Pokémon. Charizard appears as one of the Pokémon used by the Pokémon Trainer, who remains in the background of a stage while Charizard fights. Charizard is the heaviest of the three Pokémon, but is also the strongest and the fastest, though it walks the slowest. It is also capable of gliding, one of three characters in the entire game with this ability. Like in the Pokémon games Charizard is also affected by an emulation of the series' type effectiveness; it takes more damage from water attacks but less from grass attacks. Charizard also has a limited stamina, which decreases as it is on the field but replenishes while it is not, but its attacks are weaker as its stamina decreases. Charizard's standard special move is Flamethrower, which involves Charizard breathing a continuous stream of fire. Its side special move is Rock Smash, which has it break a rock with its head to damage opponents, and its up special is Fly, which has Charizard fly directly up into the air. When its down special Pokémon Change is used, Charizard is switched out with Squirtle, and is switched in when used as Ivysaur. Its Final Smash, shared amongst all three Pokémon, is Triple Finish, in which Charizard performs Fire Blast. In the Subspace Emissary, Charizard is the last Pokémon that the Pokémon Trainer collects. Lucas and the trainer first see Charizard flying into a mountain, and Pokémon Trainer points out to Lucas that it is the third Pokémon he must collect. After traveling through the mountain, Pokémon Trainer and Lucas find Charizard, who attacks them. The two battle the large Pokémon, which is turned into a trophy upon its defeat. The trainer collects the trophy, and Charizard joins the party. Charizard returns as a playable character in Super Smash Bros. for Nintendo 3DS and Super Smash Bros. for Wii U. However, in both games, it is a standalone fighter, rather than being one of the Pokémon Trainer's Pokémon, due to the removing of in-battle transformation moves. As such, Rock Smash takes the place of Pokémon Change as its down special move, while its new side special move is Flare Blitz, which involves Charizard flying directly forward, covered in fire which also damages itself. Charizard's new final Smash is Mega Evolution, which involves it Mega Evolving into its Mega Charizard X form. In addition, the glide and type effectiveness mechanics have also been removed. Like all the other playable Pokémon, Charizard can be equipped with the X Attack, X Defense, and X Speed equipment. Additionally, Charizard can use the Fake Nails equipment, making it the only fighter in the game who can use three different attack equipment types. Charizard appears, along with Squirtle and Ivysaur, as part of the Pokémon Trainer's team in Super Smash Bros. Ultimate. Its moveset is similar to that seen in Super Smash Bros. for Nintendo 3DS / Wii U, with Rock Smash being replaced by Pokémon Change. Furthermore, its stamina mechanics are removed, allowing it to be used for the whole fight with no penalty. Just like in Super Smash Bros. Brawl, its final Smash is Triple Finish and no longer has it Mega Evolving into its Mega Charizard X form. Flamethrower is a Fire-type move appearing throughout the Pokémon series and as Charizard's standard special move. Similar to Bowser's Fire Breath, Charizard spits a stream of fire from its mouth for as long as the player holds down the special move button, but it becomes shorter and weaker over time. The direction of the stream of fire can be adjusted by tilting the control stick. In addition to Charizard as a playable character, Flamethrower is also used by Charizard as a Poké Ball Pokémon in Super Smash Bros. and Super Smash Bros. Melee, and by Charmander when it appears on the Saffron City stage in Super Smash Bros. and Super Smash Bros. Ultimate. Super Smash Bros. for Nintendo 3DS / Wii U also give this move two custom variants: Fire Fang and Fireball Cannon. Fire Fang, also a move from the Pokémon games, breathes a continuous short stream of fire that hits more quickly and ends with a bite attack that deals higher damage and knockback, while Fireball Cannon breathes fireballs that travel further and do not get much weaker, but deal less damage overall. Finally, Charizard also uses Flamethrower while using its down throw. From 火炎放射器 (Kaen hōshaki), meaning "flamethrower." Rock Smash is a Fighting-type attack appearing in all of the Pokémon games. 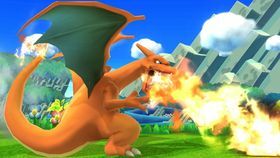 The move is Charizard's side special move in Super Smash Bros. Brawl, and its down special move in Super Smash Bros. for Nintendo 3DS / Wii U, its previous spot filled by Flare Blitz. Charizard pulls out a boulder and smashes it with his head, damaging any nearby opponents. The attack deals the most damage when Charizard is first hitting the rock, while the shards deal small amounts of damage. 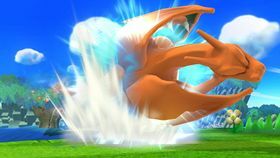 In Super Smash Bros. for Nintendo 3DS / Wii U, this move has super armor, meaning that Charizard cannot be knocked back while the move is being used. 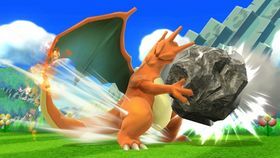 In Super Smash Bros. for Nintendo 3DS / Wii U, the first custom variant for this move is Sinking Skull, which buries the rock and decreases the power of the move but allows Charizard to bury opponents. The second is Rock Hurl, which sends out rock shards at a higher angle but does not deal as much damage. Flare Blitz is Charizard's side special move in Super Smash Bros. for Nintendo 3DS / Wii U and Super Smash Bros. Ultimate, based on the Fire-type attack in the Pokémon series and taking the place of Rock Smash from Super Smash Bros. Brawl. Charizard flies directly ahead, covering itself in fire, and is knocked back slightly when it hits anything. Charizard is also dealt recoil damage throughout the entire attack. 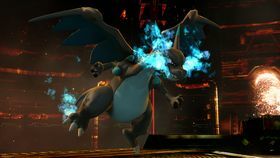 The attack's range is quite long, but Charizard does risk self-destructing itself if it goes off-stage while using it. The first is Blast Burn, another move from the Pokémon series, which is slower and does not travel very far, but ends with a larger explosion that deals more damage, both to the opponent, and Charizard. The second is Dragon Rush, a Dragon-type move from the Pokémon series, which is less powerful, has a shorter travel distance, and does not have the fire effects. To make up for those drawbacks, however, the attack delivers multiple hits to opponents, and it does not damage Charizard. Lastly, Charizard does not get knocked back if it hits anyone while using the attack, and its shorter travel distance reduces the risk of self-destruction, making the move more effective for recovery than the other Flare Blitz variations. On a side note, whenever Flare Blitz activates a fighter's Counter, the counterattack only takes into account the hit before the explosion. Fly is a Flying-type move appearing in every installment of the Pokémon series and as Charizard's up special move. 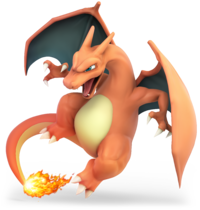 Charizard flies up into the air in a spiral motion, dealing multiple hits to any opponents caught in the attack. 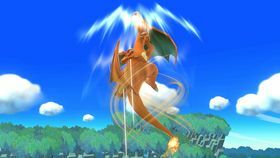 In Super Smash Bros. Brawl, Charizard covers itself with fire when flying into the air, while in Super Smash Bros. for Nintendo 3DS / Wii U, this is replaced with wind. The move is also used by other, non-playable Pokémon in the Super Smash Bros. series. In Super Smash Bros. Melee onward, the move used by Moltres as a Poké Ball Pokémon is Fly. Mew, Jirachi, and Celebi are also stated to use this move for their appearances. In Super Smash Bros. for Nintendo 3DS / Wii U, the first custom variant for this move is Rising Cyclone, which does not give as much vertical distance, but draws in foes, and has greater launching ability. The second is Fly High, which increases Charizard's flying height, but does not inflict any damage to opponents. Pokémon Change is the Pokémon Trainer's down special move shared across all three Pokémon in Super Smash Bros. Brawl and Super Smash Bros. Ultimate. When used, Squirtle takes Charizard's place. Triple Finish is the Pokémon Trainer's Final Smash, in which all three Pokémon join in to attack. During the move, Charizard uses Fire Blast. Mega Evolution is Charizard's Final Smash in Super Smash Bros. for Nintendo 3DS / Wii U, replacing Triple Finish in Super Smash Bros. Brawl. Charizard Mega Evolves into its Mega Charizard X form, given to it in Pokémon X and Y, allowing it to freely fly around the stage, similar to Yoshi's Super Dragon. Pressing the special move button attacks with Fire Blast, which sends out a fireball that explodes into the kanji 大 (dai, "big") when it hits, and the standard attack button is Dragon Rush, which sends Charizard flying in the direction held on the control stick; both attacks deal multiple hits to opponents. Mega Charizard X cannot flinch from any attacks, but it can still take damage, which decreases how long the Final Smash remains in effect. Charizard appears as an unlockable costume in Super Mario Maker. It can be unlocked by scanning the Charizard amiibo onto the GamePad, or at random by clearing the 100 Mario Challenge on Normal or a more difficult setting. The costume turns Mario into a sprite of Charizard based on the species' appearance in the Nintendo DS Pokémon games. While Mario's appearance changes with the costume, like with the other Pokémon costumes, the sound effects remain the default Super Mario Bros. sounds. Charmander, one of Charizard's pre-evolved forms, appears as a costume as well. It is unlocked by completing the I Choose You! Event Course after picking the Charmander path. Unlike the fully-evolved Charizard, Charmander uses Pokémon sound effects. 09/98 It's hard to believe, but this massive flame Pokémon evolves from the tiny Charmander. Not only can it fly at heights of over 4,500 feet, but its flaming breath is hot enough to reduce almost anything to ashes in seconds. The flames at the end of a Charizard's tail are said to be a fairly accurate barometer of its power. GB Pokémon Red/Blue A Flame Pokémon. Its fiery breath is hot enough to burn up rocks, and its wings let it fly up to 4,600 feet into the air. It's a proud Pokémon that will never use its flame breath on an opponent weaker than itself. The flame on its tail is a barometer of how much vitality it has remaining. Its signature move, Flamethrower, is a reliable technique. 3DS Pokémon X & Pokémon Y (10/2013) The iconic Fire/Flying-type Pokémon. Charizard's scorching breath can melt anything in its path. It soars through the air, seeking only worthy foes to test itself against. In Smash Bros., Charizard unleashes the destructive Flare Blitz special move - a move so strong, it even injures the user! Charizard, a Fire- and Flying-type Pokémon, can burn through anything with the flames it breathes. It is constantly on the lookout for powerful opponents. And where better to find them than in this game? Its huge build and special moves mean it can inflict massive damage, and its Flare Blitz is so powerful, it even hurts Charizard itself! 3DS Pokémon X & Pokémon Y (10/2013) Charizard's Flamethrower attack can be sustained by holding the button. The flames will gradually die, but a short break will recharge them. Charizard's down special Rock Smash crushes a rock and his foes with the pieces. Charizard won't flinch while crushing, but others can break the rock... When using Charizard's Flamethrower move, hold the button to keep breathing fire. The flames gradually die down, but you just need to rest for a bit before doing it again. If you get hit while you're using the down special Rock Smash, you won't flinch, but someone else can break the rock instead, making your attack fail. N/A In this powerful Final Smash, Charizard Mega Evolves into Mega Charizard X and takes to the air. In this form, it can charge violently in any direction or shoot horizontal blasts of fire that launch foes. Mega Charizard X isn't invulnerable, though-in fact, taking damage will actually reduce the time you can stay transformed. For this powerful Final Smash, Charizard Mega Evolves into Mega Charizard X and takes to the air. In this form, it can charge violently in any direction and shoot horizontal blasts of fire that launch foes. Mega Charizard X isn't invulnerable, though - taking attacks will reduce the length of time it stays transformed. Pit: And I can use my wings to fly! ...When Lady Palutena grants me the power of flight, that is. Palutena: But I digress. Charizard has another attack, called Flare Blitz. It's powerful but dangerous, even to Charizard. Either way, dodge the attack and keep your distance while waiting for your chance to strike back. Rizādon A portmanteau of "lizard" and "odon" (meaning "tooth" in Ancient Greek, used as a common suffix for dinosaur names); officially romanized as Lizardon. Considering the official romanization, it can possibly be a portmanteau of "lizard" and "dragon" as well, where the term used specifically refers to Western dragons. French Dracaufeu A portmanteau of draco (Latin for "dragon") and feu (French for "fire"). German Glurak A portmanteau of glut (ember) and drache (dragon). Also "-rak" come from raket (rocket). Rijamong Comes from "lizard" and "monster" as well as the Korean words ryong (룡) and yong (용), which mean "dragon". Charizard's name is a combination of the words char (meaning burnt) and lizard (since it's a lizard-like creature). If Charizard's tail is ever submerged under the water in Super Smash Bros. Brawl and Super Smash Bros. for Nintendo 3DS / Wii U, or if it is raining, its flame will still not go out. Charizard's name in Japan, Lizardon, is the same name as a character in Wario's Woods. Interestingly, Wario's Woods preceded the release of Pokémon Red and Green in Japan by a little over two years. ↑ Miiverse post about Charizard's Mega Evolution. This page was last edited on March 16, 2019, at 14:47.